Web Wednesday : Forget Facebook, get Face-2-Face! One of my goals for Web Wednesday, since the outset in June 2007, has been to promote local entrepreneurs, especially if there is a digital element to their business. Apart from running the premier networking community for Hong Kong's digerati, now widely know as "Web Wednesday", I'm also actively involved in promoting grass-roots entrepreneurship through annual events like Barcamp Hong Kong (barcamp.hk) and communities like the Hong Kong Startup Association (hksua.com.hk). And now, one of my firm's clients, British Airways has come along to offer travel grants worth HK$11 million to 30 small to medium sized businesses in Hong Kong. Simply apply online by clicking on the banner below (or on the button on this blog's sidebar on the right). This will lead you to BA's grant microsite, where the full terms are listed. Note that the application closes at 11:59pm on 15th January 2010 and is only eligible to companies that employee less than 150 people. If you are selected, your company will get "10 return business class flights to be used in Club Europe and/or Club World between 1 March 2010 and 28 February 2011". Note from the screenshot below that the site also has icon prompts (using AddThis) to share the offer via Delicious, Twitter, StumbleUpon and, their poor cousin, Facebook! Full disclosure: British Airways is a client of Fleishman-Hillard, where I lead the digital integration team for Asia. I am not receiving any direct compensation for this post. In fact, I strongly believe in activities like this where commercial entities set up grants as a means of giving back to the community, even if it is a form of marketing. Thanks for the comment, Keiko. For this campaign, there is no microsite in Chinese. 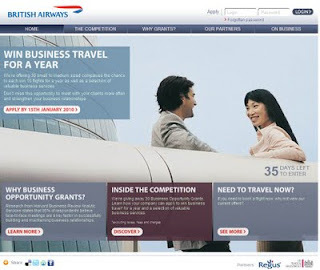 But BA.com does have a Chinese version: http://www.britishairways.com/travel/home/public/en_hk. They opted to just run the English version in this case. Help Clean Up HK's Air!